May intranscendence constitute nowadays a mode of resistance? Intranscendence invites to humility in relation to others and the planet, moving away the temptation to impose criteria based on the application of supra-human truths or existences. But also frees of responsibilities that exceed people‘s capacity or undermine their integrity. Intranscendental intelligence cancels the mystery; it reconciles people with their bodies and celebrates them. Intranscendental people affirm life and accept their inevitable finitude and last decay; enjoy love and encounters despite being aware of their cosmic and earthy loneliness; seek the good in spite of their limitations. Burdened by idealism and surrounded by useless fictions, cynical lies and militant dogmatism, their task is not an easy one. 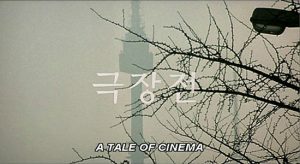 Hong Sang-soo’s film production is a crystalline example of intranscendental thought, materialized in both, the narrative construction and the details that hold it, and in the depicted situations and events. Many of his male characters are shown as intranscendent apprentices. The clash between intranscendence and remaining idealism causes them the suffering that opens the films dramatic space, however this drama is always relativized through pathos or humor.